Properties: This product has been specially formulated to the needs of those who would love to have an excellent finish on their interior walls. The buttery smooth material facilities easy filling and leveling. 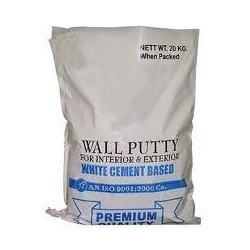 We offer our customers a wide range of Wall Care Putty. This Wall Care Putty is prepared by the experts, using premium quality raw material at state-of-the-art infrastructure base. Our Wall Care Putty is repetitively demanded by the clients, who are highly impressed with its availability at in-budget rates. WALLMASTER WALL PUTTY is an acrylic resin bound, ready to use plaster, finishing coating for preparing interior walls before painting. WALLMASTER WALL PUTTY eliminates the use of primers, Neeru - the messy lime plastering and painter's putty - the most uncertain composition mixed at the sites. We are highly acknowledged organization engaged in presenting remarkable range of Acrylic Wall Putty. We are a top notch supplier of Latafinish Wall Putty. 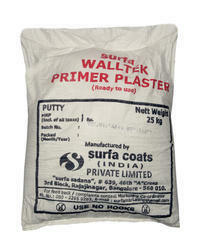 Enriched by our vast industrial experience in this domain, we are offering Acrylic Wall Putty. Keeping the diverse requirements of customers in mind, we are instrumental in providing Acrylic Wall Putty. Threesons Paints And Chemicals Pvt. Ltd.